Gold prices have taken a dip recently, and I have bought gold futures today. I bought gold futures for the December 2013 delivery contract. They expire one year from now. Values for the December contract are approximately 10 pts higher than the February 2013 front month contracts. My entry price was 1666.0 for December 2013 gold futures and my entry occurred at 12:57 my time. I chose to buy using the December 2013 contract because I am aiming for this to be a long-term trade, and I want to have the option of holding. The December 2013 contract was the farthest-out contract that had reasonable volume and open interest levels. Anything farther-out than Dec 2013 didn't have enough volume for me to feel comfortable with. I am only going to use a weekly chart, using ninja trader, to demonstrate this trade. The decision to buy was tricky for several reasons. First, I'm used to buying on 60 minute charts, but in this case I think finding the kind of signal I would look for would be tricky in that time frame at this point in time. I am basing my entry on general support levels in the daily and weekly time frames, most importantly the weekly time frame. Second, the year is almost over and that means that the US fiscal cliff stuff is going to start happening right quick. We could be having some major statements and market influencing sentiment as early as the opening tick of the evening session on Sunday Dec 31. We will almost definitely have a volatile week in currency, index, metals, and energy markets next week and the following week as people find their feet in the new "fiscal cliff" environment. I am open to the possibility that we could see rapid and sharp drops in the gold prices in the next week, and that is why I am using stop loss orders in my trade. At this time, I feel like there is more upside to gold than downside. I am willing to risk getting stopped out, so that I can be positioned well in case of an upside dynamic. Regarding the following chart, there is an anomaly I just wasn't able to fix. I used ninja trader online trading platform because it is good for weekly charts. Ninja trader is a free futures trading platform, if you don't trade on it and you are OK with nothing smaller than the daily time frame using end of day data (EOD), otherwise you have to pay for it. My online futures broker provided software, firetip, doesn't do weekly charts. This ninja chart shows a gap up about three months prior to the present. There was no gap, its just that the chart is missing a month's worth of bars. This really has no effect on the indicators, because its such a small chunk and the high and low of the price action are recorded. Also, the chart is for the February contract, not the December 2013 contract that I bought. The difference is about 10 points. 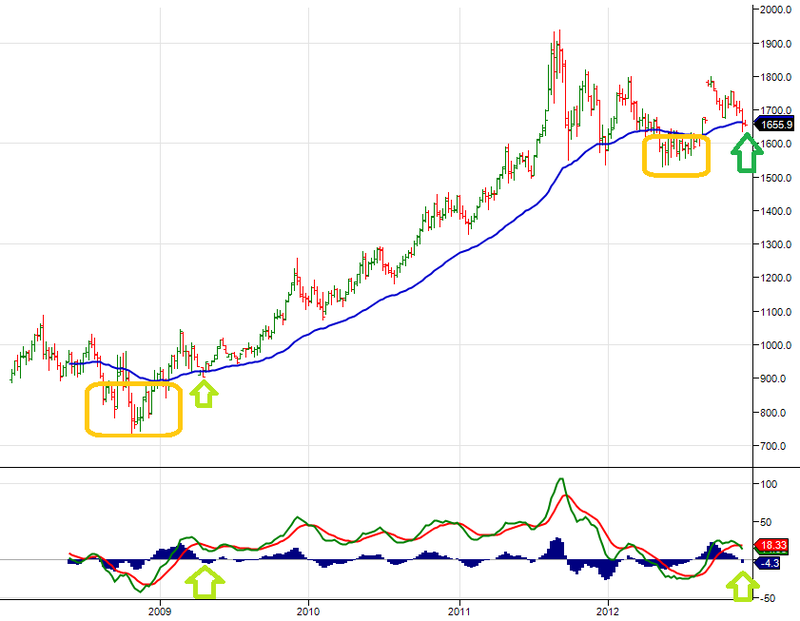 For example, if the chart displayed says 1655, then the Dec 2013 gold prices would be 1665. Let us examine the Weekly chart for February gold futures prices. The chart shown goes back roughly to the beginning of 2008, and it includes that big mortgage related bubble that burst. The area affected by the housing bubble is defined by the first yellow rectangle, roughly. We also see the 2011 "recession" and it is where we see the big spikes in price just at the top of the chart. Anyone that reads this futures blog regularly may remember I was looking for gold buys all summer long, this was during the area that is in the second yellow rectangle. The areas in the two rectangles are important because they were significant amounts of time spent below the blue moving average. They could be considered deep consolidation. At least the first one was, the second is still yet to be seen, but I propose that it is an area of deep consolidation. It is in, or shortly after emerging from, periods of deep consolidation in uptrends that one should consider buying. In this case, the signal is to buy gold futures. Both yellow rectangle periods in gold prices were accompanied by significant fundamental data in the form commercial and institutional short/long relationships. This is very clearly demonstrated on COT charts, which I will not show here. What we saw both times after the yellow boxes was a short sharp rise in prices, and then a return to the moving average. The return the to moving average are demonstrated with green arrows. Last time, four years ago, this was the best opportunity to get in on the ground floor after consolidation break-out. It is my suspicion, that we are seeing a repeat of this behavior again. I intend to at least try and be on that ground floor. Another similar characteristic that occurred shortly after the first yellow box consolidation, was that weekly MACD values crossed to the negative. The MACD moving averages stayed on the positive side of 0, but the histogram was negative. We are seeing the same behavior again at this moment just as prices are poking into the gold prices weekly moving average on the upper chart. This trade is essential a long-term weekly time frame swing trading entry. In other words, it is long term trend trading on dips or buying on pullbacks. I have placed a stop loss order, and I will exit this trade, regardless of my bullish sentiment, at the first sign that significant lows may occur. I was trying to get long all summer, and I kept getting stopped out. I missed the fall run up in gold prices, as a result. I had foreseen that we would see prices return to the moving average, and I knew that would be my next good opportunity. That has occurred now, and I have acted according to my big picture plan. Now I must manage my trade, and hope for favorable outcomes. In other markets, natural gas was tricky. I got long just above 3.40 a few days ago, and we didn't see the rise until this morning. I am out of that trade, it was lagging. I am still bullish in sugar, and looking for a good entry. It looks like it might be gradually shifting into an upward dynamic on the bigger picture. I have mixed feelings about the USDX, I could see it making strong moves either up or down. It's hard to see with clarity. Probably because of the impending doom of the fiscal cliff. I I make any substantial trades, I'll post them. I'm leaning towards not posting my short-term 60 minute time frame natural gas futures trading. If anyone is specifically interested in seeing those trades, go to Contact Us and send me a note, and I may consider posting them more frequently.